There are several wardrobe essentials one must have come summertime. On that list are an easy-breezy floral print dress, comfortable sandals (preferably a style that can withstand miles of walking), a tropical swimsuit, and last but certainly not least, a pair (or more) of classic, versatile, and breathable linen pants. Now, if you don't yet own the latter—the lightweight, breezy bottoms that will have you looking and feeling cool this season—then you've come to the right place. Ahead we've rounded up the 12 best linen pants to shop now (and wear over and over again this summer). Not sure how to style them? Linen pants are one of the most versatile pairs of bottoms because they can be worn with just about everything. Pair them with your go-to warm-weather sandals, take a sportier route by slipping into a pair of crisp white sneakers, or opt for the always-classic French girl–approved ensemble—wedge espadrilles and flowy linen pants. As for what to wear on top? The options are endless, but a white button-down, a fitted tee, or a linen dress can never go wrong. Now read on to see and to shop our favorite linen pants for the warm weather. We're loving the button detailing on this pair. Try a pair of wide-leg linen pants for some extra ventilation. White is always a summer classic. Wear for work, beach, and brunch. Pair these with crisp white sneakers and a no-fail black tee. Wear your shirt tucked in to show off the cool belt on these linen pants. Available in sizes 6, 10, and 12. We're loving this color for summer. 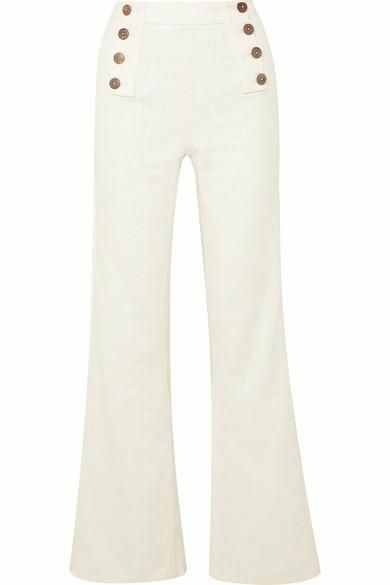 Team these linen pants with your favorite swimsuit for a day at the beach. Gingham and linen? Two summer must-haves in one. How fun is the ruffle detailing on these? It looks like a skirt, but it's actually a pair of pants. Now, if you purchase a pair (or two) of linen pants, you'll certainly need to know how to wash them. Read on for a handful of tips when it comes to laundering your linen.